The story of David vs Goliath never felt so real in this match up. The first Southern Honor Championship Kevin Ryan showed a lot of ability, speed and heart in the early part of this match until Logan caught him in mid air on the outside of the ring and bashed him back and fourth through the guard rails. During the match the ref got knocked out. Logan set up a table and went to spear Kevin through it. Kevin would move and Logan would go through the table, setting up a 450 from the top rope from Ryan. The ref slowly comes back for the count. He gets to a two count and the lights go out. When they come back on Sunny Daze is in the ring and hits Kevin with the Sister Abigail. Sunny goes to get the ref who is on the out side of the ring, until Austin Theory’s music hits. Sunny charges Theory who has a trash can. Austin ducks a clothesline and knocks out Sunny. Austin would toss the trash can to Creed who would catch it, Theory would roll through the ropes and land a drop kick to the trash can knocking out Creed. He lays Ryan over Creed and calls for a new ref, who comes out and counts three leaving Kevin Ryan defeating the odds once again and still Southern Honor Campion. These two have fought all over Georgia and they steal the show every time. This was no different. The evolve star was taken to the limits by Mack in this stellar match but Theory was just too much for him to handle. This match had a little bit of every thing! Shannon Moore is in the best shape of his life and his girl Lindsay Snow is no joke. Alan Angels and Dani Jordyn brought the fight tho in a very amazing effort. These two are bright stars on the Georgia Indy scene and they showed Moore and Snow that they can bring it. Following the loss Alan Angels turned on Dani by giving her the wing snapper and then laying in a fury of punches on her. Gary Lamb came out to stop Alan’s temper tantrums and got knocked down in the process. Gary exploded at Alan and demanded the security to get him out of his building and told him he was suspended for the December show. Matt and Joey (The Lynch Mob) got revenge on David Ali and Lee Johnson (The Shotgun Killers) by picking up a victory following a Joey Lynch Moonsault. Legacy tried to take Sunny Daze out of his comfort zone by trying to lock up and make him wrestle and took Sunny off his feet with speed and agility. Sunny cut Sean’s technique off early tho and made the match ground and pound. Legacy would catch Sunny Daze in position for a massive power bomb off the second rope for a close two. After a fury of kicks and legacy looking to close in on a victory, Sunny Daze caught him with a Sister Abigail out unexpectedly for the win. Two new comers to the SHW roster this show. 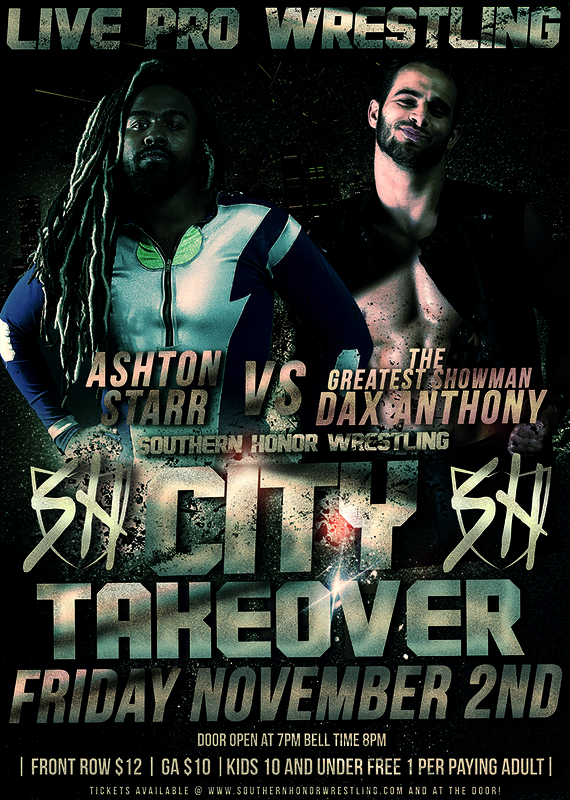 Owen Knight has made a name for himself in the Atlanta area for some time now and Shawn Dean a Chicago native and now student of AR Fox, had a lot to prove. Owen Knight would get the win via Submission. Dax Anthony made his debut facing Ashton Star. No matter had sassy Ashton gets, the fans seem to just love this guy. Dax tried hard to get the fans behind him and by the end of the match it was split down the middle. Dax pulled off the victory following a TKO. Ashton may have something to complain about tho as it appeared he kicked out before 3 even tho the ref counted 3.